During this year's presidential and congressional campaigns, many candidates from both parties made global trade an issue, voicing concern that Americans are losing jobs to China, Mexico and other parts of the world. Based on the reactions at campaign rallies, followed by the election results, that message struck a chord. Now, policy makers are contemplating whether adjustments are needed to existing U.S. trade agreements. As our elected officials ponder what that might entail, it’s important to ensure that any actions address the existing concerns without creating new ones. U.S. dairy exports have substantially led to more American jobs and more options for American dairy farmers with a positive ripple effect for the U.S. economy, especially in rural communities. In my role as the U.S. Dairy Export Council's senior vice president of trade policy, I want to engage the entire U.S. dairy industry so the following five points are communicated vigorously in future policy discussions about trade agreements. 1. 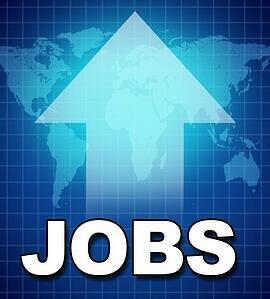 U.S. dairy exports create tens of thousands of American jobs. USDA estimates that at the milk production level each $1 billion of U.S. dairy exports generates over 20,000 jobs and almost $3 billion of economic output. At the manufacturing level, USDA calculates that U.S. dairy exports support around 3,200 jobs per $1 billion of exports and generate nearly $4 in additional economic activity per $1 of exports. For Mexico alone, our largest buyer at a quarter of our total dairy exports last year, this means Mexican buyers supported at least 30,000 American jobs, primarily in rural America. It takes the equivalent of 1,500 average-sized U.S. dairy farms to supply the volume of milk we ship to Mexico in the form of various dairy products—that’s a lot of farm families relying on the continued free flow of U.S. dairy products to Mexico. On the flip side, impairing those sales would deliver a harmful employment hit to farmers, workers in companies supplying inputs and services, and downstream processing plant jobs, as well as cities with large port facilities heavily dependent on trade. 2. Losing the sales equivalent of one day per week wouldn’t be pretty. In 2015, exports were equivalent to 14% of U.S. milk production on a total milk solids basis. That equates to all of the milk produced on American farms one day of each week. Put another way, one in seven milk tankers leaving American farmers are now turned into products and ingredients sold overseas. For an industry where prices rise or plummet based on a shift in supply and demand of just a few percentage points, that figure carries outsized weight. The top three markets for those exports are Mexico, Canada and China. Together, those three markets accounted for 44% of our dairy exports last year. In all, that’s a lot of American-made milk leaving the country, with sales revenue coming back to the United States to benefit American companies, their employees and the communities they spend their money in across the country. We didn’t just get there overnight. Over the last two decades, U.S. dairy exports have grown from less than a billion dollars of mostly government-assisted shipments to $5 billion in commercial sales last year. A National Milk Producers Federation (NMPF) economic analysis last year calculated that U.S. free trade agreement dairy provisions have played a key role in that growth, generating an additional $8.3 billion for the industry between 2004 and 2014. 3. The U.S. dairy industry needs a level international playing field. Know who would be happiest to see our exports curtailed? The competitors that U.S. dairy companies gained ground on in recent years. Those European and Oceania companies dominated global dairy markets for decades, aided by subsidies and monopolistic practices. The U.S. dairy industry has been the new kid on the block over the last decade or so—snagging market share in many countries in a way that’s driven U.S. job growth and better returns for U.S. farmers. Those foreign competitors would love to be able to run the table again at our expense, pushing our dairy product supplies back onto our domestic market with catastrophic impacts to farmers and processors. For instance, all major dairy suppliers have FTAs with South Korea, one of the world’s biggest cheese importers. The FTA we have there keeps us in the game. Without it, U.S. cheese exports to Korea would be slapped with a hefty 36% tariff to bring in U.S. products while our competitors could keep shipping millions of pounds of cheese duty-free. We are already facing competitive disadvantages with key competitors since they have been a lot more active negotiating trade deals. That disadvantage could worsen if the United States fails to keep pace with the aggressive trade expansion agendas of Oceania and Europe. 4. Looking beyond tariffs, restrictive trade barriers must be addressed. Although our existing trade agreements have been for the most part boons to American agriculture by removing tariff barriers to our exports, nontariff barriers to U.S. agricultural exports are posing an ever-growing challenge. The current Administration has worked hard on these issues, but much work remains. Canada. The country's go-to response to any uptick in imports playing by long-agreed rules is to try to change those rules to shut imports back down in order to sustain its unique supply management program. This is no way for one of America’s closest allies to act. Its latest policies are putting jobs in New York, Wisconsin and elsewhere at risk as dairy plants that made big investments to ship safe, versatile ultrafiltered milk to Canada now face policies that are increasingly shutting them out. Whereas NAFTA has been a roaring success for agriculture in Mexico; any adjustments to the deal on agriculture should focus on repairing the broken relationship with Canada on dairy. The European Union. The EU has been hard at work building on its abysmal track record on agricultural trade barriers by using geographical indications to ban the use of common cheese and other food names around the world. Those policies are ones the EU has been systematically planting in our export markets—spreading a novel contagion of trade barriers around the world. 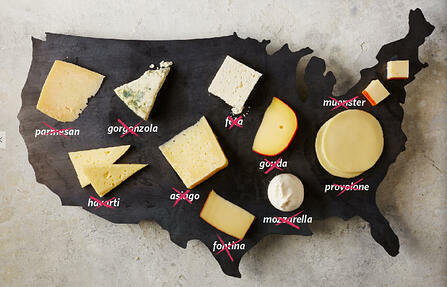 A recent study found that blocking the use of generic cheese names with European roots (names like parmesan, feta and mozzarella) would cost the U.S. up to 175,000 rural jobs. The new Administration should consider telling Europe we won’t restart TTIP negotiations until the EU cleans up its act on this and a host of other completely unjustified agricultural policies that violate existing commitments to the U.S. Without those good faith actions, how do we trust that a new agreement with the EU will not be similarly disregarded? India. Third place is tougher to call, since there are many contenders, but India takes it by a nose due to its brazen 13-year-long ban on U.S. dairy imports. This major and fast-growing dairy market has blocked U.S. dairy imports without scientific justification for years and refused numerous efforts spanning two Administrations to find a way forward. The blunt reality is that India wants to enjoy all the benefits of trade in services with the U.S. while rejecting our agricultural products like dairy. That type of win-lose set-up is unacceptable and the U.S. should use look at some creative ways to send that clear message to India. TPP includes ground-breaking rules designed to help tackle these types of problems, which has been a key basis for our support of that agreement. But as we’ve also been clear—those TPP provisions aren’t a silver bullet. They would still need additional aggressive efforts to create real changes in how countries handle their agricultural trade commitments to us. 5. 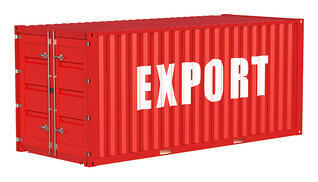 Encourage our government agencies to address day-to-day regulatory and technical issues to keep our exports moving. 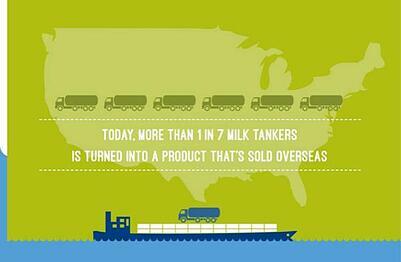 The U.S. dairy industry has created incredible wealth in rural communities by exporting dairy products. U.S. dairy farmers, working hard seven days a week for 52 weeks a year, too often find that their products run into regulatory requirements in various countries that, even if well-intentioned, can block rigorously-tested, safe U.S. dairy exports. While our competitors have government officials specifically dedicated to resolving technical regulatory issues in a manner that helps their industries supply foreign markets, in the U.S. regulatory agencies too often tend to do the opposite. For instance, if import authorities in another country want an assurance that the food we are shipping them—and that would be allowed to be sold here in U.S. grocery stores—is “fit for human consumption,” that should not be treated by overly cautious lawyers as an unreasonable and risky request. We need to prioritize ensuring that our regulatory agencies are tasked with having a direct hand in supporting exports in a way that enhances jobs and our rural economy. Our agencies must be incentivized to resolve simple requests related to our exports and where the requests are more challenging, in finding creative solutions to provide the assurances needed to keep trade flowing. 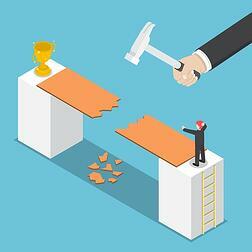 Not all foreign demands are justified; but too often we’re getting in our own way. We in the dairy industry have always shared the view that well-negotiated agreements should be pursued and supported. Agriculture, without a doubt, is one of the areas of our economy where trade agreements have been beneficial and where exports have created more American jobs, particularly in rural areas where quality employment is most critically needed. The U.S. dairy industry is a perfect example of this. As the new Congress and president contemplate how to approach trade next year, our industry looks forward to helping move new, dairy-friendly policies forward with the above five points in mind. The U.S. Dairy Export Council (USDEC) and the National Milk Producers Federation (NMPF) sent a joint letter today to President-elect Donald Trump, outlining the importance of exports to the U.S. dairy sector and seeking further dialogue on ways the organizations can work with the incoming administration on trade policy. There’s always room for improvement; the best way to get there is by building upon what’s already working well on a sector-by-sector basis. 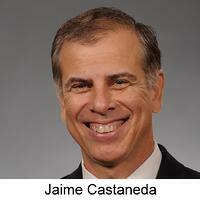 Jaime Castaneda is senior vice president of trade policy at the U.S. Dairy Export Council.